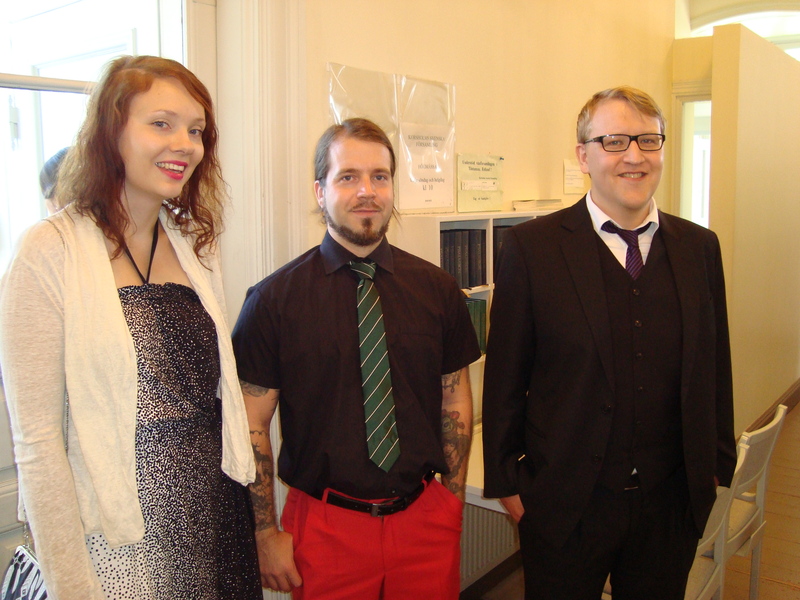 This was the first thing I heard when I stepped into the church for Antti & Tiina’s wedding. “I’ve seen you naked.” Thing was… he had. This was Vesa, whom long time readers will remember from my first time in a Finnish Sauna almost exactly six years ago. Now, getting here was a little bit of an adventure in itself. On Thursday morning, July 3rd, I woke up Monika at 4:45am so she could drive me to the bus station where I would get on a bus and then spend the next 11 hours traveling from Kaunas to Riga (change busses) and then on to Tallinn, where, after a few hours wait, I would climb aboard a ferry for a 2 and a half hour ride across to Helsinki where I would get on the number 9 tram to take me to Jennica’s place. It was a long day! By the time we finally settled in for the night it was after midnight. Of course, being Finland, the sun was up and the sky was bright around 4am so not much sleep for me. I got up, showered, and in short order was saying goodbye to Jennica as she went off to work and I grabbed a bus to the Helsinki airport. Sure enough, it fit. So breathing easier I enjoyed the flight. The airport is smaller than the promenade on a major cruise ship and there are big plate glass windows separating baggage claim from the people waiting to claim the people claiming said baggage. Since I had no baggage to claim (see previous paragraph) I walked right out and saw Tiina waiting for me. I hadn’t seen her for two years, since she visited Kaunas. Antti was waiting with the car and they drove me to the hotel (same one they were staying at, which was nice) and I dropped off my bags, grabbed my book and headed out to explore the town. I’d been to Vaasa once before but I didn’t remember all of it so it was nice to have a bit of a wander, I ended up down by the water where I could read and relax for the afternoon. I made it back in time to watch football (watching with Finnish commentators isn’t really much better than watching with Lithuanian ones) and went to sleep. The next morning I puttered around my room, taking care of little bits of business, enjoying the scrumptious breakfast spread the hotel provided and waiting to hear from Kimmo, who was going to drive me to the church. He was a friend of Antti and Tiina’s who had driven down from Oulu and had graciously offered to give me a lift (and translate if need be). We shared a laugh and told the story and then I was approached by a guy dressed in cutaway tails who looked a lot like Antti. This was Tiina’s brother who was also Antti’s Best Man. He handed me a program. Just me. He didn’t give one to anyone else. It was then I noticed that in the pews where we were to sit programs had also been laid out, so why was I being handed one? When I opened it, I had my answer: Everything had been translated into English and inserted on a separate sheet of paper. I quickly realized I was the only non-Finnish speaking person there and Tiina had made sure I wasn’t going to be left behind. Even with everything else going on she made sure I was taken care of. This is what friends do. The service itself was beautiful… and short! I didn’t understand a word but I’ve been to enough weddings (and had the timeline written out for me in English) so I was able to follow along easily enough. After the exchange of vows and rings, we all went outside to take a few pictures then Antti and Tiina got into a classic BMW to head to the reception. Kimmo and I followed along with the other 40 or so guests. The reception was held in a building on the University campus, which in itself looked like a reclaimed factory. The room had huge picture windows which faced the water and several long tables set up with name tags at specified place settings. Again, Tiina’s thoughtfulness was apparent as in front of my place, the sign with the menu and order of the night’s festivities was gratefully written out in English. A word about the festivities. I said the wedding ceremony itself was short, and it was. It was called for 1pm and by 1:45 we were already heading back out to the parking lot, passing the incoming members of the 2pm wedding ceremony. The reception, though, was something else entirely. After some pictures outside with the car we headed inside and things gilt started around 2:30 or so with some snacks and wine. Now, a wedding in the states which started at 2:30 in the afternoon would reasonably expect to end around say 8 or 9 at night. Maybe earlier. Not Finnish weddings. There was a note at the bottom of the schedule which stated we were to enjoy ourselves until 3:30…. am. Glancing through the order of things I noticed there were three distinct meals slated to happen in addition to all the things one would normally expect from a wedding. Everything was lovely and I didn’t understand a word of it, but again, a wedding is a wedding and the key elements were all there so while I may not have grasped the particulars, it wasn’t hard to understand the gist. There was one interesting thing they did, which I really liked. In turn, Antti and Tiina went around the room and introduced everyone to the group, explaining who they were and what they meant to the couple. Naturally, when it was my turn, I was asked to stand then Antti said “I’m going to say this in Finnish so everyone will understand.” I nodded and laughed. I picked up a few words, Vilnius (where we met) and Jokerit (a Finnish hockey team) among them. Among the speeches, again, while I couldn’t understand the specifics the emotional resonance was all there. The only one I’m sorry I missed was Tiina’s BFF Riika who came up with a small folded piece of paper. she opened it to reveal a lengthy document and then recited a poem which had everyone in hysterics. When it came time to toss the garter and bouquet (or banquet as my English translation stated) we all headed outside. Tiina threw her flowers (caught by Riika) then Antti went in for the garter. As he buried his head under Tiina’s dress out came an assortment of items, including an ice scraper and one of her ballet shoes, before the garter itself. One of the nice things about having a party in Finland in the early days of summer is you don;t have to worry about darkness. When I left, with a few of Tiina’s friends from university, it was 2:30am and while the sun itself wasn’t out, it was still light enough to read. And yes, there were people (Kimmo included) who stayed until 3:30. The next day Kimmo and I and several others (mostly family and Riika) went back to the venue to help clean up the place before Tiina and Antti dropped me back at the airport for my flight back to Helsinki (where I discovered that yes, my bag was indeed overweight… BUT Finnair didn’t charge for one bag to be checked so I was okay). I think it’s the main one. It’s in a former factory which has been converted and the hall we were in was right off the water. Does that help?